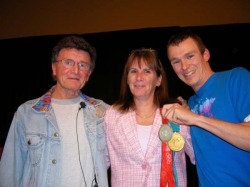 Steve King has been a race/event announcer and event emcee/commentator for over 25 years as a result of being a race director, reporter, statistician and still a very active competitor who was inducted into the BC Athletics Hallf Fame in 2012. Below is a compilation of some of the events that he has or have been connected with in the capacity of announcing/colour commentating and/or voice-overs. Please feel free to refer to any of the same for the purposes of a reference. World Triathlon Championships from 1988-1994, Ironman Canada, Nice Triathlon, B.C Winter and Summer Games, Vancouver International Triathlon, Vancouver Marathon, Victoria International Triathlon, St. Croix Triathlon, Texas Hill Country Triathlon, Kananaskis Relay, National 10km road race Championships, Canadian National Triathlon Championships, Vancouver Sun Run, Toronto Waterfront Marathon, Vancouver Int. Half Iron Triathlon. 1994 Commonwealth Games (Swimming, road cycling and race walks), 1999 Pan American Games, Ironman Canada, Ironman New Zealand, Peach Classic Triathlon, Victoria Half Ironman, Vancouver Int. Half Iron, Great White North Half Ironman, Apple Classic Triathlon, Victoria Int. Triathlon, Vancouver Triathlon, North Shore Triathlon, Echo Valley Half Ironman, Oliver Half Ironman, Desert Half Ironman- Osoyoos, Sylvan Lake Half Ironman, Shawnigan Lake Half Ironman, Sooke Half Ironman, Prestige Half Ironman (Cranbrook), Ultraman Canada, Ultraman World Champs (Hawaii), Grand Columbian Half and Full Ironman, Penticton Junior Triathlon, Summerland Sprint Triathlon, Walnut Grove Sprint Triathlon, Wasa Lake Triathlon, Cap Tex Tri (Austin, TX), Texas Hill Country Triathlon, U.S. Olympic Triathlon Trials (Bellingham,WA), Okanagan International Marathon, Vancouver International Marathon, Royal Victoria Marathon, Peach City Marathon, NB Fall Classic, Calgary Stampede Marathon, Blossom 10 miler, Scotiabank Half Marathon - Vancouver, World Triathlon Championships (Kelowna 1988, New Zealand 1994, Vancouver 2008), 1991 Hawaiian Ironman World Championships, World Police & Fire Games (1989, 1997 and 2009 - triathlon, mountain biking, hill climb, cycling road race, open water swimming, half marathon), National & Provincial Cross-Country Running Championships, Canmore Challenge Trail Races, National Cross-Country Skiing Championships, World Cup Cross-Country Skiing (Silver Star Mtn), Masters World Cup X-C (Sovereign Lake), Cariboo 50km Cross-Country Ski Marathon, Larch Hills Loppet, NorAm Canada Cup/Junior World Trials X-C Ski, Nickel Plate Loppet, Kamloops Spoke/Overlander X-C, NorAm/BC Cup Biathlon, Sovereign Lake Cross-Country Ski Loppet, Kelowna Apple Loppet, Ullers Winter Triathlon, National Mountain Bike Championships (Apex Mtn. ), Vancouver Sun Run, Victoria TC 10kms, Richmond Flatlands 10kms, Lethbridge Moonlight Runs, Kajaks Track & Field Meets, Grouse Grind, Seek the Peak, Haney - Harrison Relay and Solo, James Cunningham Seawall run, Langley Historic Half Marathon, B.C. Distance Swimming Championships, Blazing Saddles Criterium, Giro di Burnaby Criterium, and numerous other road race, triathlon and duathlon events.